A Singular and Whimsical Problem is a novella that was free on Kobo a couple of weeks ago. I know Rachel McMillan from the Twitters. I kind of clued in a little while ago that she's been writing Edwardian mysteries when I saw her tweets about them. I was curious but like most things in my life it slipped my mind. When I saw this companion novella to her novel A Bachelor Girl's Guide to Murder was being given away, I thought it was finally time to give her writing a try. Our two intrepid lady detectives, Jem Watts and Merinda Herringford, are bachelor ladies living together in the City of Toronto. This was my first experience with them both and I learned that they are appreciated by at least two members of the police and press who help them out: Jasper Forth and Ray DeLuca. They're methods are based on the works of Sherlock Holmes. Women, especially poor women, seek them out to solve their problems. In A Singular and Whimsical Problem, the ladies have three separate cases to solve: a young suffragette missing from St Jerome's Home Reformatory for Incorrigible Girls, a shipping magnate's wife's missing cat, and the mysterious comings and goings of a waitress's sister. These cases appear to have no connection, but as the ladies find out, even small cases lead to big breaks. This was cute and quick. Jem and Merinda get into hijinks with their sneaking around Toronto, sometimes in disguises. Of course, they solve the mysteries and just in time for Christmas. Yes, it's a Christmas novella, but the season doesn't feature heavily so it's fine that it's now April. 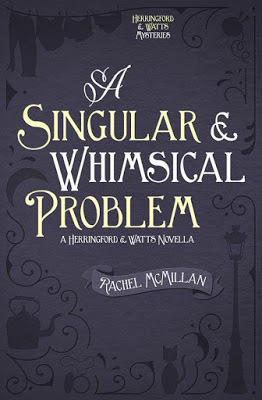 At only 54 pages, A Singular and Whimsical Problem is a pleasant introduction to the Herringford and Watts series. I'm looking forward to reading more. It sounds cute! I do love the title of A Bachelor Girl's Guide to Murder. Did I see it is available on NetGalley now? I just checked and it's not there now. Maybe it was?